Flame shutters are similar to conventional steel slatted and galvanised steel roller shutters that operate vertically, closing in the event of a fire. Our fire shutters are available in safety ratings of up to 4 hours. 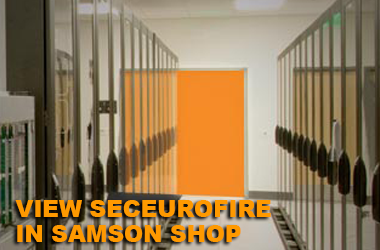 One of the main benefits of Flame shutters are their ability to act as a means of physical security during normal use and a fire safety shutter in the event of a fire.The construction is as a normal steel security shutter in principal so does provie a good level of physical security with easy operation by various control methods. Security and fire protection combined in one neat package, a smooth, compact door design – available in one, two or four hour ratings. The Flame Shutter is an electrically operated vertical fire shutter, consisting of a steel slatted curtain and galvanised steel box assembly and guide rails. 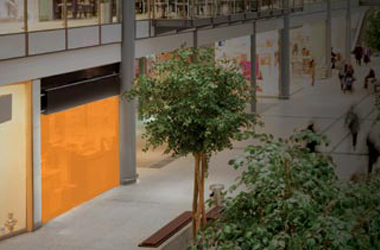 The box, curtain, guide rails and bottom rail can be powder coated as an optional extra to help co ordinate with corporate or internal colours. Designed to be a security barrier during normal use and to be closed automatically during a test or an emergency situation. In the event of receiving a fire alarm signal the barrier will perform a powered descent to create a fire resistant barrier. In the event of power failure Flame Shutter will close using the battery backup feature. Flame Shutters design allows for both face or reveal installations as required by the building design. 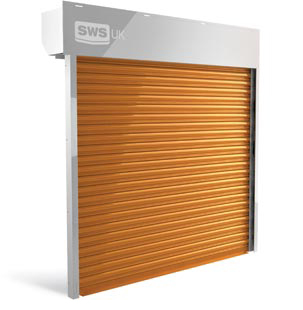 This product is uniquely capable of providing specifiers with a choice of Flame Shutter 60, 120, or 240 minutes integrity performance in accordance with the standards mentioned above. Sizes can vary according to integrity rating and larger sizes require a hood support bracket. Please check for confirmation. Maximum sizes can vary according to integrity rating. Approved Standards - The fire resistance performance of shutters to BS 476: Part 22: 1987. The fire resistance performance of shutters to BS EN 1634-1: 2008. There is a requirement under The Regulatory Reform (Fire Safety) Order 2005 for companies to ensure fire safety equipment is maintained and a record kept.